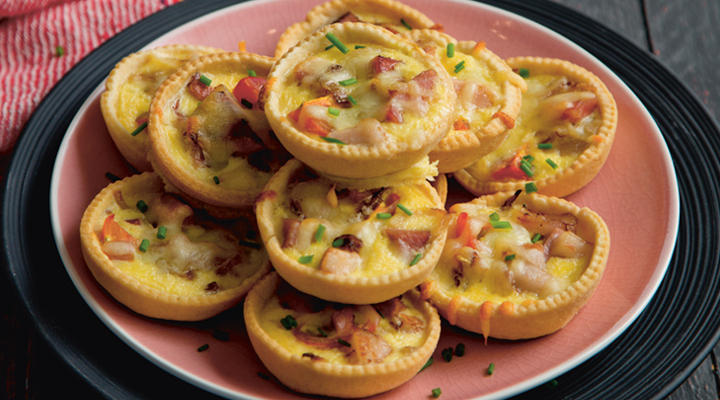 These tasty quiches can be made in advance and frozen, ready to be defrosted overnight for individual midweek dinners for busy families. 1. To make the pastry, sieve the flour into a large mixing bowl and add a pinch of salt. Rub the butter into the flour and salt mixture with your fingertips until it resembles very fine breadcrumbs. Add the egg yolk and mix in just enough ice-cold water to bring the dough together. Knead the pastry gently to bring it together, then wrap in cling film and rest in the fridge for 15 minutes. 2. Preheat the oven to 180°C/gas mark 4. Grease a 12-hole muffin tin with a little butter. 3. Roll out the pastry and stamp into 12 circles that are a bit bigger than the muffin tin holes using a scone cutter or the rim of a glass. Line the muffin tin with the pastry circles, then fill with ceramic baking beans. Bake in the oven for 15 minutes, until the pastry has set. Allow to cool, then transfer the cases from the muffin tin to a baking tray. 4. Meanwhile, heat the olive oil in a large pan set over a medium heat. Sauté the onion, ham and sun-dried tomatoes for 2 minutes. Remove from the heat and divide between the baked pastry cases. 5. In a separate bowl, beat the eggs, milk and cream together with the chopped parsley and a pinch of salt and pepper. Pour the egg mixture into the pastry cases, then scatter over the grated cheese. Bake in the oven for 10 to 15 minutes, until the filling has set. Serve warm.